Robert E. Howard, "The Phoenix on the Sword"
Figure painted for fun. 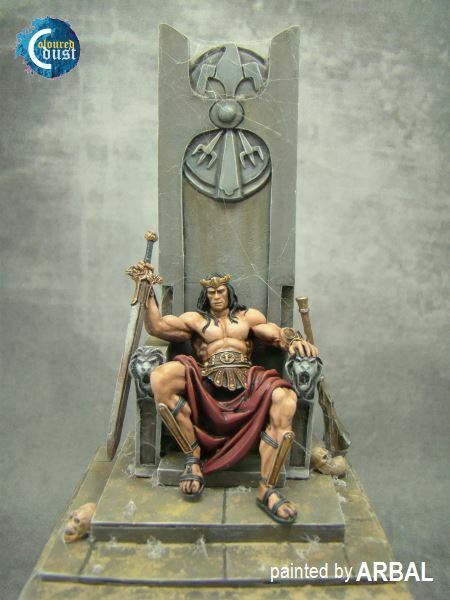 In my terms, this is the initial stage, when Conan find sword in the dungeons ... Throne, on which it sits, I want him to be strong dusty and dirty. Nice smooth work. I like the sculpt. Does he have any scars? I would have liked to see a closeup of the face, and the leather and metal belt. I am sure both have some nice details that you would like to show off. Good work. Very enjoyable to look at. Abral ten Konan jest super. You get a nine for not knowing your Conan-lore and referencing that dreadful movie with Arnold instead of Robert E Howard's original works. A close-up or two might be able to off-set that. you've done great work here! congratulations! !